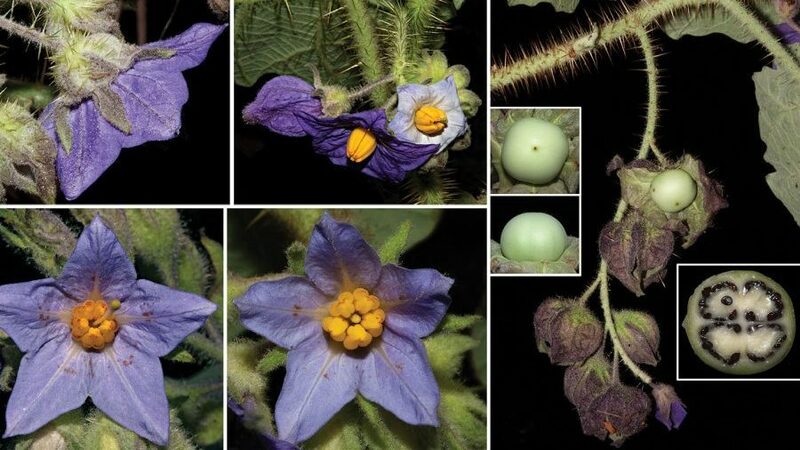 Armed with long thorns and sticky stems, newly described plant Solanum kollastrummight look like a villain by plant standards, but a closer look on this curious new species will reveal its star-like nature in the context of its ecosystem. Recently described in open access journal PhytoKeys, this newly discovered tomato relative boasts stems densely armed with prickles of up to 17 mm long and to 2.3 mm wide at the base. In fact, the new species is baptised after yet another showy defence mechanism. The name kollastrum comes from the Greek words for glue and star, referring to the peculiar sticky hairs that end in a star-like formation. 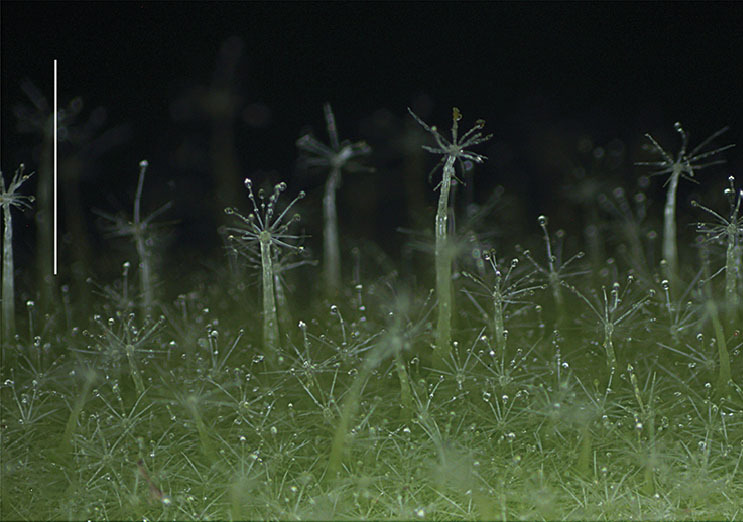 Close-up of the unusual star-like shape of the sticky hairs’ protrusions along the stems of the new species. While all this heavy armour might at first fool you that this new species lives in isolation, a closer look has revealed that, contrary to the expectations, S. kollastrum starts as the good guy in its ecosystem. Field observations of the new species have suggested that it’s preferred by medium- to large-sized bees with buzzing behaviour. The fruit structure of S. kollastrum, with fruits hanging outside its foliage on long axes, along with the numerous relatively small seeds and the release of a mild sweetish scent, suggest that fruits eaten by bats. The heavy armour is, in fact, not that unusual in the group of ‘spiny solanums’ to which the new species belongs. With approximately 110 species of spiny solanums, the Brazilian Solanum flora is exceedingly diverse. In its own right, Solanum is an extremely diverse plant genus to which important crops such as potatoes, tomatoes and eggplants belong. 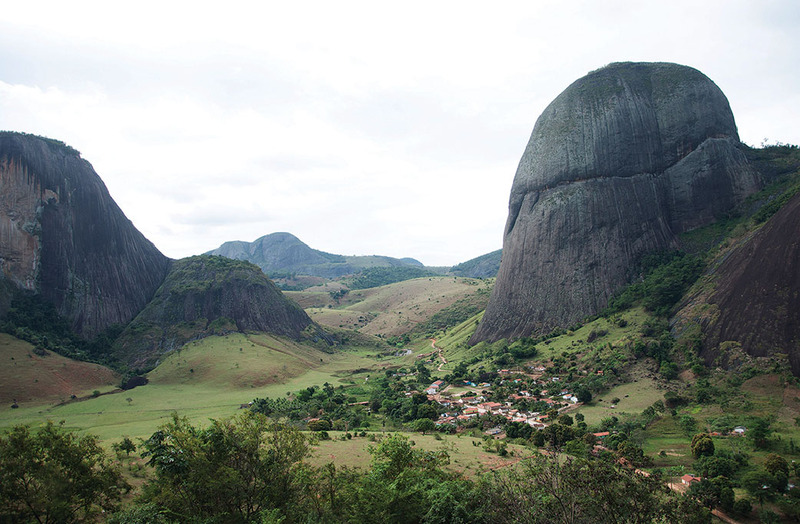 Endemic to eastern Brazil, the known records of the armed new species are mostly concentrated along the Mucuri River watershed, where it inhabits edge of small forest fragments. In fact, the species is especially seen in areas at the base or on the peculiar and gigantic geological formations known as inselbergs or ‘sugar loaves’). Some populations were also found in disturbed sites near these rock outcrops, such as borders of unpaved roads and pastures. “The discovery of S. kollastrum, a robust and conspicuous plant growing at the roadsides in regions close to large urban centres, highlights how insufficiently known the Brazilian flora is,” explain authors from the Universidade Federal de Minas Gerais and Universidade Federal do Oeste do Pará, Brazil. A small village along the typical for the region inselbergs — a preferred habitat of S. kollastrum.